오늘이 올 겨울중 가장 추운 날이라고 하는데요. 가족 여러분들 모두 건강히 잘 지내고 계신지요. 오늘 오전 배용준씨의 한류엑스포 폐막식 참가 보도 기사와 관련해 아래와 같이 알려드립니다. 배용준씨의 한류엑스포 폐막식 참석 여부는 아직 아무것도 정해진 바 없으며, 확정되지 않은 행사 참여 기사나 추측 기사로 인해 가족여러분들의 혼란이 없으시길 바라겠습니다. 앞으로 더 즐겁고 행복한 소식 전달해 드릴 수 있도록 노력하는 BOF가 되겠습니다. One month has already passed this year, and it’s now February. It said that today is the coldest day of the year and we hope that you and your family are healthy and doing well. We want to inform you the following—which relates to the this morning’s article of Bae Yong Joon ssi’s appearance at the Hallyu Expo closing ceremony. Nothing has been decided regarding whether or not Bae Yong Joon ssi will appear at the Hallyu Expo closing ceremony, so we hope to not confuse you because of the unconfirmed or presumed articles about his attendance of the event. We’ll continue to be a hard-working BOF to inform you of the happy news. Boom posted this on the Talk Box of BYJ's official home. How are you, dear family? In this morning, content that Mr. BYJ will attend the closing ceremony of the 'Hallyu Expo' was reported once again. The report telling that Mr. BYJ will attend closing ceremony stage of the 'Hallyu Expo on March 8 is not true, and as we previously gave you a notice, we once again let you know that Mr. BYJ is not scheduled to attend the closing ceremony of the Hallyu Expo. We are worred as inaccurate fact was reported, and hope that our family would not get confused. Dear all family, please careful not to catch colds in changing season. Please be healthy and happy all the time. 왕사신기'가 오는 5월 21일 MBC에서 방송된다. 방송을 앞두고 더욱 큰 관심을 받게 되었다. We would like to inform you that Bae Yong Joon has completed his 1night2days stay and returned home today. This visit to Japan was completely for private purpose and was decided at last minute. There was no official event including any shooting. Since there was no opportunity to give greetings to all family, we had to report to you this way. I hope you would all understand and approve this situation. It is change of the season, we hope you would take care of yourselves. 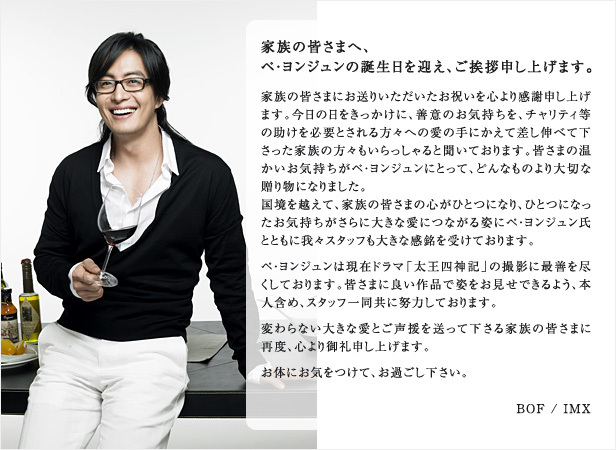 We ask you for your continuing warm support for Bae Yong Joon. How are you, dear families. Recently, against our intention, we gave our dear families much trouble with drama 'TWSSG'. First, we give our hearts of both apology and appeciation to our dear families, who have been agonizing and worried along with us in entire process until now. The filming of the drama 'TWSSG' plans to be resumed in the middle of this month using a script that is touched up. Also, we make clear it again that 'rumor about discord between production company and actor', which has been reported by some media, is groundless. All the while, actors including BYJ, has been progressing post-production works, such as post-production recording for the parts that have been filmed already and shooting for posters, etc. We are very much aware of expectation and support our dear families have been sending to us for a long time. Although Mr. BYJ and his management company have done all their bests, we feel nothing but sorry because we ended up giving you much worries after all. As much as you are giving us much expectation, we will put all our bests in order to reward you with drama with much more degree of completion. We would like to ask you unchanging support and encouragement for the 'TWSSG' so that Mr. BYJ can meet dear families again in a better appearance. HOWL posted this on the Talk Box of BYJ's official home. 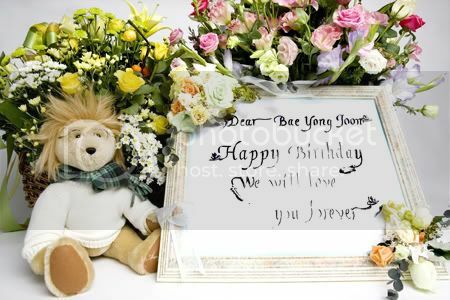 Dear Family, We send our greetings on Bae Yong Joon’s Birthday. We sincerely send our appreciation to family for the celebrations you have sent. We hear that this day triggered some family members to send their good will to charity and other persons in need of help. Your warm feelings became one of precious gifts for Bae Yong Joon. Bae Yong Joon and all staff are very touched to see that hearts of family members are getting together beyond national boundaries, and also to see that one feeling leading to bigger love. BYJ himself and all staff are working hard to bring you a good work. Again, we sincerely send our appreciation to family for your unchanging love and support. Please be careful of your health and stay well. It's a fall weather. How are you doing? Finally, the drama < Taewangsasingi >, which you've waited for long time, will be brocasted beginning next week. We would like to introduce the broadcasting schedule to the family. By the way, please watch Lee Ji Ah Ssi, who is a main actress of < Taiwangsasingi > and became a part of BOF's family now, with lots of interests and love. Please be careful of your heath when the seasons changes, and enjoy the new drama < Taiwangsasingi > BOF. [BOF Notice] We give dear family Chooseok greetingsHow are you, dear family. We greet you in time of September Hangawi*. We pray and wish that health and happiness as abundant as full moon be at homes of dear family. and share warm and generous heart with neighbors around you. and hope to have your unchanging support until the end. Please return safely from your native places, and we will meet you again in bright and energetic appearances. about Bae Yong Joon after reading the article that he has been hurt. On 24th, Bae Yong Joon has cut the ligament in his finger with a sword during shooting of action scene. The shooting was suspended and luckily he has received emergency treatment and headed right way to the hospital to receive the full treatment. It may be difficult for a while, but he is currently joining the scheduled shooting. We ask for your support for Bae Yong Joon so that he could do his best for the shooting till the end. We will do our best with him, so that he will be able attend the shooting as scheduled. We sincerely send our appreciation for your concern and support for the drama TWSSG. It is change of the season, please do take care of yourselves.